The competition for one of the three available brick & mortar casino licenses in Massachusetts is heating up, and Foxwoods Casino from Connecticut is right in the thick of it, as they start to reveal plans for their proposed resort-style casino in the somewhat sleepy suburb of Milford, Massachusetts. Full disclosure, I live in the area. With a town hearing scheduled for June 3rd, Foxwoods has also taken the step of opening an office in the downtown area of Milford, as well as sending out mass-mailings to all Milford residents explaining not only their plans for the site, but also answering several of the more frequent criticisms being leveled by opponents of a casino in Milford, which calls itself Casino-Free Milford. Foxwoods letter goes on to indicate that the casino would also bring 2,500 construction jobs to the area, as well as up to 4,000 permanent full and part-time jobs when construction was complete and the casino opened. 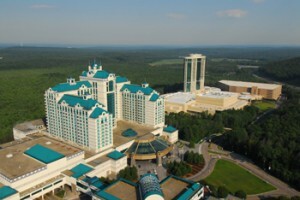 Foxwoods also claims that they will be purchasing some $50 million in goods from local vendors every year. “We are aware that many of you have concerns about potential impacts, including traffic, public safety, and infrastructure such as water and sewer, and want to assure you that we are hard at work gathering information to address those concerns at our meeting with the Board of Selectmen scheduled for June 3rd. “We understand that we have an obligation to provide the citizens of Milford and the surrounding communities with information that will allow you to make an informed decision, and we take that obligation very seriously. The Foxwoods Casino project is seen as a bit of a long-shot for the Boston area casino license, where it is pitted against two other proposed locations: Suffolk Downs, a racetrack just outside the Boston city limits where a race-track already exists which is being proposed by Caesars Entertainment, and the Mystic River proposal in Everett, MA that casino mogul Steve Wynn has proposed for the Boston area casino.